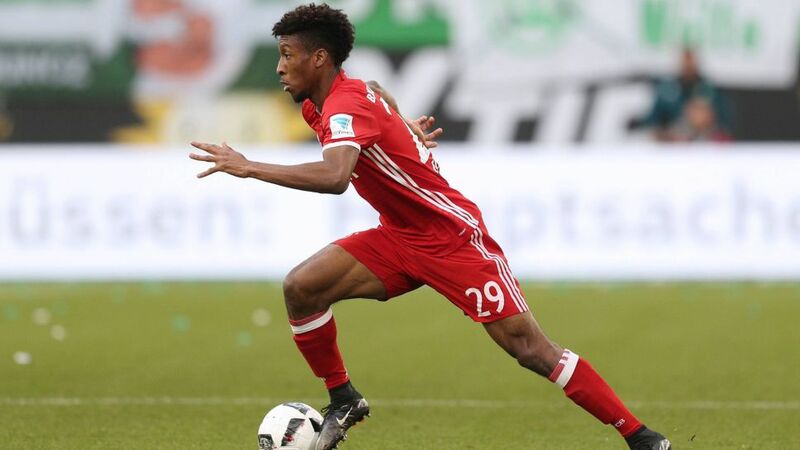 Bundesliga | Bayern Munich's Kingsley Coman: "I'm not a kid here to watch - I'm here to play and win"
Bayern Munich's Kingsley Coman: "I'm not a kid here to watch - I'm here to play and win"
Kingsley Coman remains determined to establish himself at Bayern Munich after finding his first season under Carlo Ancelotti more of a challenge than his debut campaign in the Bundesliga. The 20-year-old winger was one of the stand-out performers as Bayern swept to the 2015/16 title under Pep Guardiola. Fast forward 12 months and Coman has a fifth league winner's medal in as many seasons with Paris Saint-Germain, Juventus and Bayern, but injuries and the stunning form of Franck Ribery and Arjen Robben meant he played a fringe role in the triumph. Speaking to France Football, however, the France international is confident he will be a central figure for Bayern in the years to come. Question: In April, Bayern took up the option to buy you from Juventus. At 20 years old, after Paris Saint-Germain and Juventus, do you finally feel comfortable at Bayern? Kingsley Coman: I'm very good at Bayern. I had a magnificent first year, a second that was a little more complicated. But the club has always been behind me. I spoke to the board and they reassured me. They believe in me, and me in them. Question: Does this second title have the same taste for you as the first? Coman: A trophy is a trophy at this level. Even if I have played less this season, I have always felt part of it. I'll celebrate in the same way. Question: You have had two great coaches in Pep Guardiola and Carlo Ancelotti. What is the difference between them? Coman: They have the same approach overall. They are both permanently in the competition, and don't need to turn things on their head to get results. Pep Guardiola is more about tactics. Carlo Ancelotti is perhaps more about the person and man-management. Question: You played more under Guardiola. Why did the situation change? Coman: I was perhaps in a position that suited me a bit better. I had fewer injuries too. I played more on the wing, and the coach asked me to take people on. That's what I do best, it's the essence of my game. This season, it's a bit different, but a good player must be able to adapt to instructions and respect the choices of his coach. When a team is doing well, he's not going to change it for you. It's up to you to show what you can do to change things. And I believe actions speak louder than words. I will never ask a coach for an explanation. I have my pride. I want to earn my place on the pitch, without complaining. Coman: Those moments strengthened me. They also enabled me to diversify my skills. But I had learned even more at Juventus. I played in a position that wasn't at all mine, almost uniquely on my weak points. Here, I play wide right or left, always in the areas that I know. Question: How do you rate Bayern's season? Coman: It's good. We're champions of Germany. The Champions League leaves us with some regrets with us getting knocked out in the quarter-final by Real Madrid. But we did come up against the holders, who are in the final again. We don't need to be ashamed of those defeats. It's not a bad season, far from it. But we can always do better. Bayern always wants to win. Question: At 20 years old, do you still feel like a 'little youngster' at Bayern? Coman: Not at all. You can't have that state of mind at a big club. You're here to play. It's certain that there are icons at Bayern, players who have done incredible things for the club. But to push them, to earn your place, you have to show that you're at their level. At a big club, they don't wait for you. If you're injured or you're not playing, the team goes forward without you.